I attended the Bebo developer platform announcement this morning in San Francisco. The announcement seemed to go down very well based on immediate response, though only time will tell if the expected impact is achieved. But the nuances in the formula are what make an online platform launch successful. Create an invite-only experience: This is true with restaurants, art galleries, clubs and just about any socially-driven service. Make a select few feel important by treating them differently, and they will then be your advocate. Bebo invited press and partners to a small-ish rooom to give their presentation at the Metreon. Those people then felt responsible for spreading the news. Make it newsworthy: I wouldn’t say that the Bebo platform was a secret, by any means, but the features that make it worth talking about were kept secret until the event. In particular, the crowd seemed very pleased to hear that Bebo decided to emulate Facebook’s success by making their platform fully compatible with Facebook’s. Follow standards: Developers are not generally interested in proprietary environments unless there is a substantial gain to be made by leveraging that environment. Platforms on the Internet should default to known and proven standards, and when they do deviate, there should be compelling reason to do so. Bebo indicated that there might be features in the future that are Bebo-specific such as micropayments, and I suspect the developer community would be happy to customize their apps for Bebo when those features are ready. Prime the pump with partners: An ecosystem is not an ecosystem if it doesn’t have partners. So, don’t launch a service for partners with no partners already committed. But more than that, partners are proofpoints that the wider market wants to validate that what you offer is in fact real. Give them the stage. Make them successful, so others want to follow suit. I wasn’t all that impressed with the NBC Universal app showcased at the Bebo event, but the Gaia Online and Flixster apps were solid. And the 20 or so partners demoing in the back of the room after the presentations were great evangelists for the platform. They were proud to be there and happy to sing Bebo’s praises. Be real: I’m always a sucker for a self-deprecating joker, but Bebo founder Michael Birch backed up the laughs with substance. He admitted that they intend to follow Facebook and do whatever they do which is a totally viable strategy in this space, at this point in time. Of course, he gave himself a great defense should they get pounded by the press, but his approach was very refreshing in a market that’s increasingly crowded full with ambition and arrogance. Again, the response by developers and then the subsequent uptake by users will be the real indicators of success. 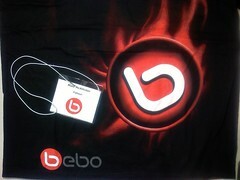 But Bebo gave themselves as good a start as any by getting the launch off on the right foot. There’s a similar relationship betwen form and function where alone each piece of the equation is weaker. Balanced properly amazing things start to happen. Substance and openness need eachother.